Like most designers, I’m a daily user of Adobe Photoshop and remember watching the premiere of content-aware fill nearly two years ago. What I saw in the original demo blew my mind, but a few major shortcomings kept me from integrating the tool into my workflow. Simply put, it didn’t always work the way it should. In a sneak peek guided by Photoshop Senior Product Manager, Bryan O’Neil Hughes, Adobe has leaked some quite impressive features that are forthcoming with the release of CS6. 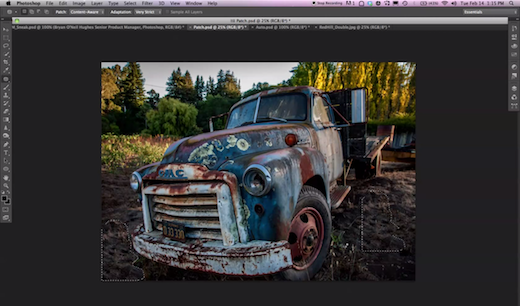 This video specifically shows off some of the recent advances in Photoshop Content-Aware technology, demoing how users will soon be able to seamlessly move or remove an object from an image like never before. All of the tricks shown in the video below can be recreated in earlier releases of Photoshop, but the amount of time and effort that goes into the process of recomposing or restructuring an image not always worth it — unless you’re a seasoned pro hired to do just that. While there are tons of other apps to get excited about in the realm of graphic and Web design (Pixelmator, for instance), Adobe’s suite dominates the market for a reason. We’ll be sure to keep our eyes peeled for the next sneak peek as we get closer to the release of CS6 and Creative Cloud. You may have also noticed that the Photoshop interface is much darker now than in CS5.5. The Photoshop team released a video earlier this month detailing the change.